Flying is the mode of transport that is most damaging to the climate. Air traffic, however, has been increasing considerably. There is no alternative to reducing air traffic if we want to travel in a way that does not compromise the future of our grandchildren and people around the world. 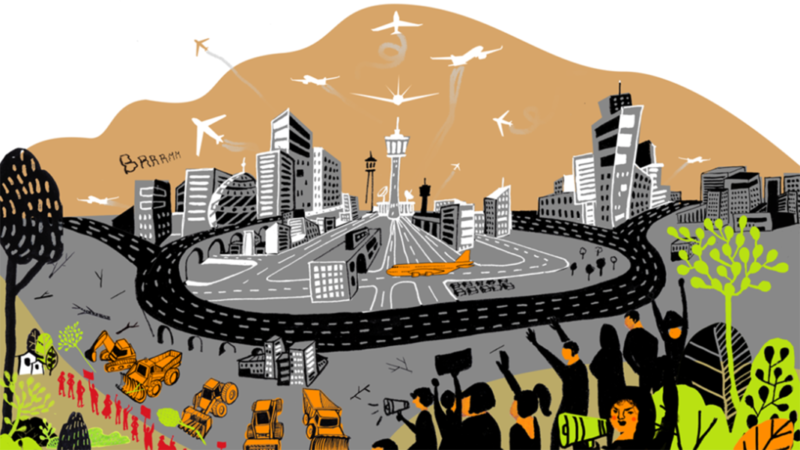 The collective Periskop coordinates the international network Stay Grounded, which is a growing global network of local airport opposition groups, climate justice activists, NGOs, trade unionists, academics, groups supporting alternatives to aviation like night trains, and organisations supporting communities which struggle against offset projects or biofuel plantations. A weekend trip to Barcelona? Or a long distance relationship in Paris? For the European middle and upper class, scenarios like these are no longer unusual. While less than 10 % of the world’s population has ever been on a plane, the consequences are mostly borne by less privileged others: neighbours of airport areas that are affected by the noise, health problems or relocation; ecosystems; future generations; and the population of the Global South that is already suffering the consequences of the climate crisis. Within the Stay Grounded network we work for the reduction of air traffic on an Austrian as well as an international level. The network connects different initiatives and facilitates mutual support between groups, as well as providing information and raising public attention through direct action and media work. Stay Grounded has become an international key player with more than 110 member organisations and much more organisations that signed the position paper. The network emerged in 2016 when coordinating global action weeks at airports during the international conference of the ICAO (International Civil Aviation Organisation). The network went public officially with its own website in 2018.